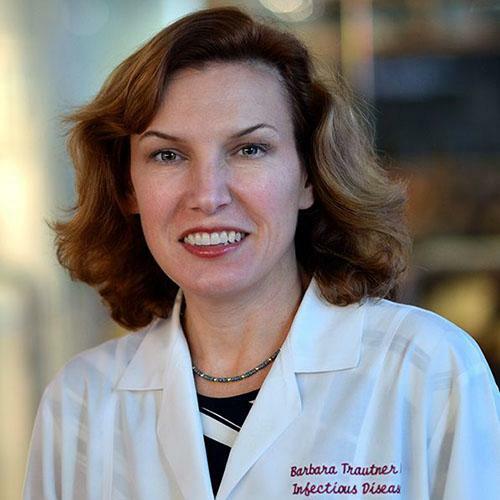 Barbara W. Trautner, M.D., Ph.D., is an infectious diseases clinician-investigator at Baylor College of Medicine and the Michael E. DeBakey Veterans Affairs Medical Center, affiliated with the Center for Innovations in Quality, Effectiveness, and Safety (IQuESt). Her primary research interest is the development of new strategies for the prevention of catheter-associated urinary tract infection (CAUTI). She has worked in this area for the past 13 years, supported first by an NIH K23 award and then by a VA Career Development Award. While on career development award support, Dr. Trautner obtained her PhD in clinical investigation from Baylor College of Medicine Graduate School of Biomedical Sciences. Her interest in CAUTI prevention has led her to develop two productive branches of investigation, one in health services research and one in microbiology translational research. Dr. Trautner's outcomes research has focused on reducing antimicrobial overuse, particularly for the extremely common condition of catheter-associated asymptomatic bacteriuria. Her team recently completed a successful VA Health Services Research and Development merit review project utilizing guidelines implementation to decrease inappropriate treatment of catheter-associated asymptomatic bacteriuria. She is also involved in a nationwide project funded by the Agency for Healthcare Research and Quality to decrease CAUTI and antimicrobial overuse in long-term care facilities. The overall goal of Trautner's translational research has been to develop novel strategies for prevention of CAUTI in persons who have chronic bacteriuria, such as those with neurogenic bladders or chronic indwelling catheters. One area of investigation is bacterial interference, or using benign bacteria to prevent symptomatic infection with pathogens. In clinical trials Dr. Trautner's group utilized urinary catheters coated with a biofilm of benign E. coli to achieve bladder colonization and protection from CAUTI. Previous work also included nanoscale modification of the urinary catheter surface to create a protective biofilm.